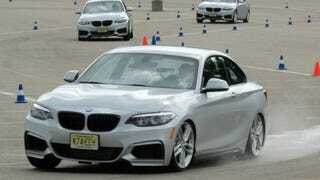 Last month I attended the BMW Ultimate Driving Experience at Met Life stadium in northern NJ. I got to toss around a brand new BMW 228 M Sport, met some really cool people and discovered that, yes, in spite of some odd choices as of late, BMW is still committed to the "ultimate driving machine" philosophy. BMW has been began offering the Ultimate Driving Experience to the general public since 1998. It went on hiatus for a few years when the economy took a hit, but then it came back. The objective of this program to have current owners and potential customers experience the full performance and engineering of BMW models on a small race course. The real purpose of course is to turn potential customers into buyers, and make current owners evangelists for the brand. The UDE event is free to to the public and I convinced my friend Bob to take the two hour drive with me to north Jersey. When you register you have a few options you can pay to autocross an M3 or you can autocross for free in a 5-series or 2-series. Because I'm cheap, I choose the free option, and picked the 2-series. I was confused as to why someone would want to autocross a 5. We arrived a bit early, checked in at the registration tent and we were given instructions as to what time to meet on the autocross course and to enjoy some refreshments in the lounge. From the lounge we headed over to the Harmon Kardon auditorim tent thingy for a presentation before hitting the track. The presenter went on an on about the "Ultimate Driving Machine" ethos explaining why rear-drive cars are dynamically superior to front-drive cars. I wanted to raise my hand and ask about the upcoming 2 series Active Tourer and possible FWD 1-series in the works for the U.S., but I didn't want to be "that guy." The presentation included basic car control for the autocross course with a discussion of how to correct under-steer and over-steer, hand placement, etc. Time to race, we leave the auditorium and there were about a dozen 2-series coupes lined up outside; they split us up into teams of about 10 people. Then we piled into the cars to be shuttled to the course. I sat in the back and found it to be surprisingly roomy in the small coupe. We get to the course and are introduced to the instructors. These men and women have some serious racing pedigree. Most of them were pro or semi-pro racers with a wealth of behind the wheel experience ranging from karts, to sports cars, to full-fledged Indy cars. Our instructor lived walking distance from turn 10 at Indianapolis, and his grandfather won the Indy 500 in the 50's. Bob and I get into the car and our instructor says he is going to drive two laps to show us the course, one slow to explain the turns and one to model how it is really done. Then we would each get two laps in the car. He gets about 3/4 through his first lap and says "I think you guys have it..." and then steps on it. The tires squealed at every turn, and every braking point my stomach went to my throat. This dude was no joke behind the wheel. He comes into the pit area and points to me, "Ok man, it's your turn. I need to to drive like that." The first lap I push it a little bit maybe 6/1oths to get a feel for the course, the whole time I'm getting directions from the pro, "Aim toward the left cone....full-throttle...brake, brake, brake! " I start my second lap and he says, "Ok, give it more power out of the corners, don't worry the stability control will keep the car on the line." So I push it even more; on one of the back corners I come in a little too hot, and feel the car step out in the back and I give a little steering correction. I believe the kids are calling it just a dab of oppo. I figured the instructor would be a little ticked that I took that turn too hard...he wasn't, "Yeah man! That was great." A few more turns I have to pit the car. Because my friend Bob was being tossed around in the back seat, he felt a little queasy after those laps. He took a minute to get some air and he was in driver's seat. After Bob's lap the whole team re-grouped for a little relay race. Each of us would get one hot-lap, get out of the car, tag the next person who would then throw down the best lap they could. The entire team's time would be added together in a friendly competition. Some of these people really came to drive, and were not shy about tossing this 228 around. One of the participants popped his Go-Pro on the car to record our race. If you want to see my terrible lap in which I kill a few cones, fast forward to the 13:30 mark. I'm the doofus with the light blue shirt and grey hat. In between the sessions, I chatted with some of the participants. About half of them were BMW owners already with a variety of cars ranging from a modded 1M to a leased 7-series. The rest of us were either BMW fans that were too poor to buy one (like me) or folks that are considering a purchase. Here is my take away from this experience. First, I had more fun at this free event than I did at some of the other super-car track days that set me back about $200. The main reason being that the instructors really encourage you take the BMW to its limit, whereas the other folks are more concerned about you not crashing their quarter million dollar super-car. Second, the 2-series is a wonderful little car. With the exception of the steering that I would have liked a bit more feedback from, the balance, the power and the handling were spot-on especially with the optional track package. Third, these types of events do have some influence on a purchase. Sitting in the back of the 228 I thought, "You know, I could fit a front-facing child seat in here." Before I the event I considered the 2-series a car that I respected, but didn't really want. Now I want one of these cars, but I will have to wait until the CPO examples come under $30,000. Finally, with all the silly niche models that BMW makes like the X4, the Active Tourer, Grand Coupe etc... I really do think the automaker is still committed to making cars for us. The 2-series, the Jalop Edition 32oi and the M coupes/sedans are still amazing driver's cars. They may not have the same visceral connection as the ones that came before, but they will still put a smile on your face on during your commute or on the racecourse. So if the BMW Ultimate Driving Experience comes to a town near you, sign up even if you can't afford one. They don't mind.